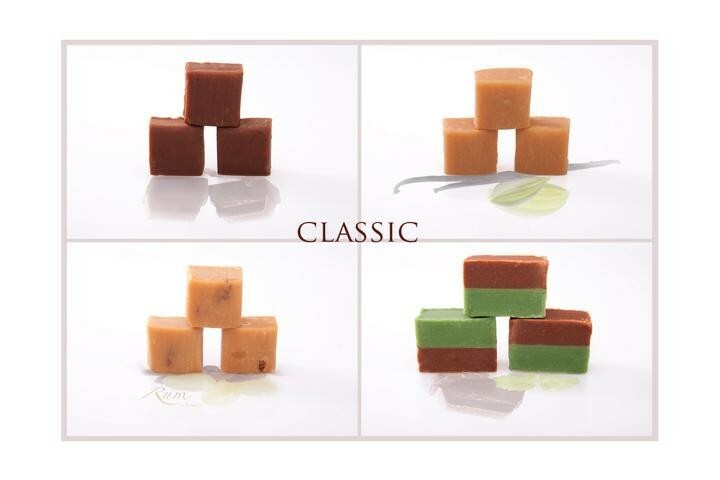 For all who do not know our fudge and for those who do not to want to commit to specific flavours is our collection bag in 3 versions. 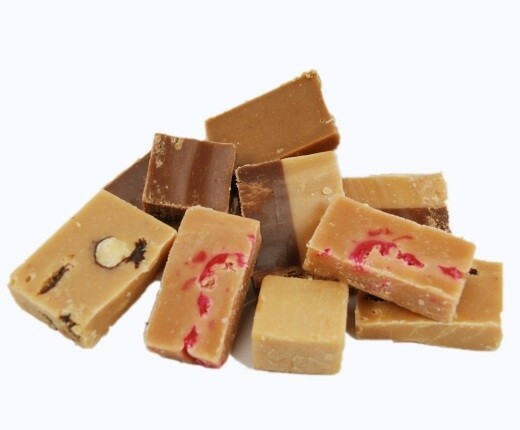 Our fudge is a sweet and rich confectionary made from sugar, butter, and milk. The individual bags each weigh 250g. 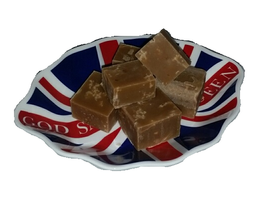 Our fudge is hand made in England. 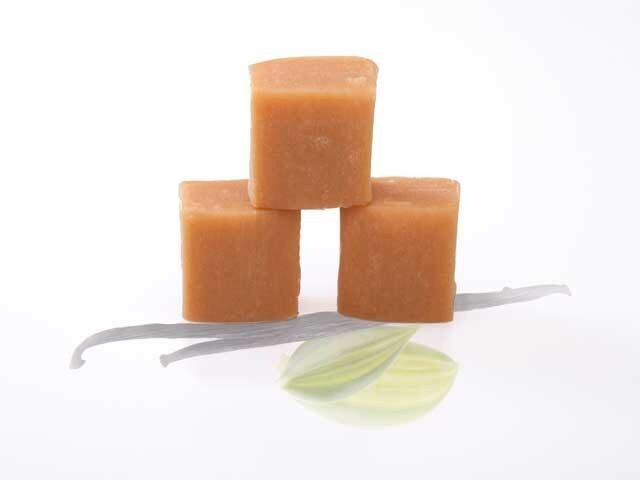 Sugar, Glucose Syrup, Hydrogenated Vegetable Fat, Skimmed Milk Powder, Salt, Emulsifier: Soya Lecithin, Flavoring. Chocolate: Sugar, Glucose syrup, Hydrogenated Vegetable Fat, Skimmed Milk Powder, Cocoa Powder, Salt. 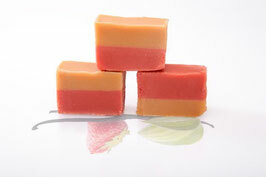 Emulsifier: Soya Lecithin, Flavouring. Sugar, Glucose syrup, Hydrogenated Vegetable Fat, Skimmed Milk Powder, Raisins, Salt. 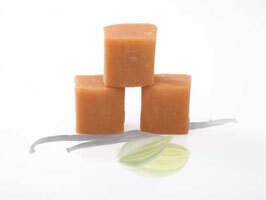 Emulsifier: Soya Lecithin, Flavouring. Sugar, Glucose Syrup, Full Cream Condensed Milk, Non Hydrogenated Vegetable Fat, Plain Chocolate (2%) (Sugar, Cocoa Mass, Cocoa Butter, Emulsifier: Soya Lecithin; Natural Vanilla Flavouring), Egg White, Cocoa Powder, Flavouring, Natural colour: E120. May contain traces of Peanut/Tree Nut. Sugar, Glucose Syrup, Full Cream Condensed Milk, Non Hydrogenated Vegetable Fat, Egg White, Natural Flavouring, Natural colour: E120. 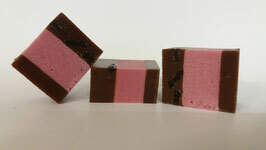 Sugar, Glucose Syrup, Glace Cherries (11%), Full Cream Condensed Milk, Non Hydrogenated Vegetable Fat, Egg White, Brandy, Natural Flavouring, Colour: E120, E127, Preservatives: E202, E220. 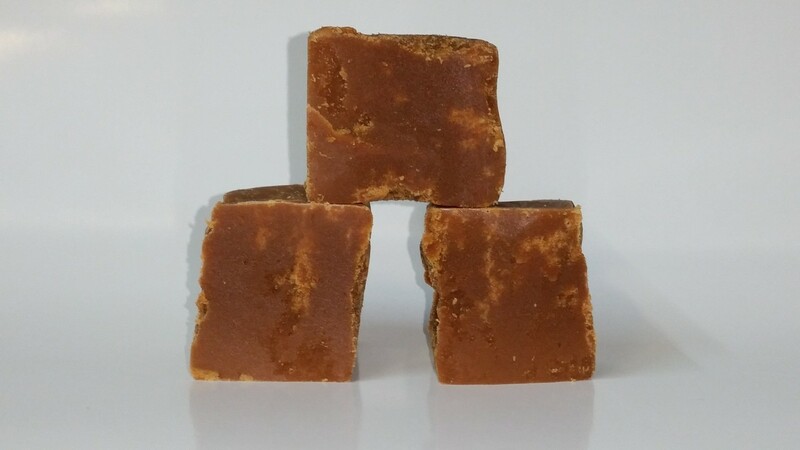 Sugar, Glucose Syrup, Full Cream Condensed Milk, Non Hydrogenated Vegetable Fat, Plain Chocolate (2%) (Sugar, Cocoa Mass, Cocoa Butter, Emulsifier: Soya Lecithin, Natural Vanilla Flavouring), Egg White, Cocoa Powder, Flavouring, Natural Colour: E160c. Sugar, Glucose syrup, Full Cream Condensed Milk, Non Hydrogenated Vegetable Fat, Banana Chips 4% (Banana, Coconut Oil, Sugar), Plain Chocolate (2%) (Sugar, Cocoa mass, Cocoa Butter, Emulsifier: Soya Lecithin, Natural Nanilla Flavouring), Egg White, Cocoa Powder, Flavouring, Natural Colour: E161b. Sugar, Glucose Syrup, Full Cream Condensed Milk, Non Hydrogenated Vegetable Fat, Walnuts (4%), Egg White, Flavouring. Roasted Peanuts (44%), Sugar, Glucose Syrup, Full Cream Milk, Non Hydrogenated Vegetable Fat, Egg White, Cornflour, Preservative: Citric Acid, Natural Flavouring. You can´t decide what to take? 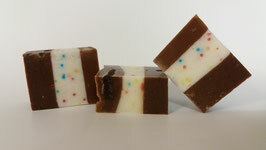 Then Take our Surprise Fudge bag with different kind of sorts in it... and let your self be surprised for what sorts you get. 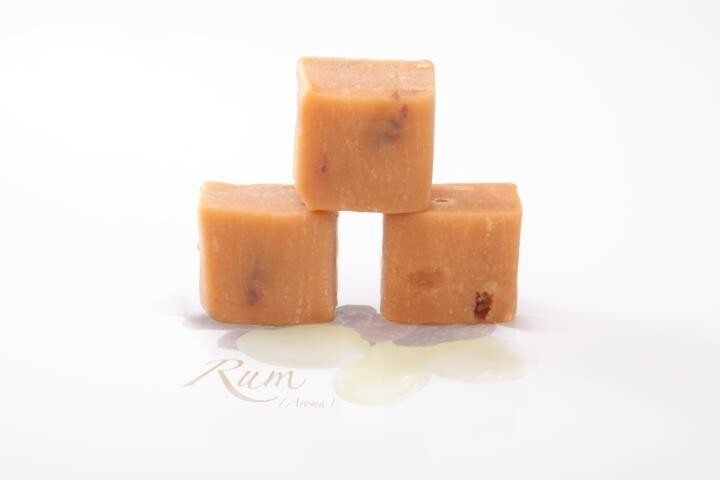 Our Christmas Pudding Fudge is a handmade soft English fudge with a true taste of the traditional "Christmas Pudding", with real fruit peelings and raisins. Simply eating it just reminds you of Christmas and having a after dinner traditional "Christmas Pudding" with the family, absolutely delicious. Christmas pudding is a type of pudding traditionally served as part of the Christmas dinner in Britain and in some other countries where it has been brought by the British. It has its origins in Medieval England and is sometimes known as plum pudding or just "pud". 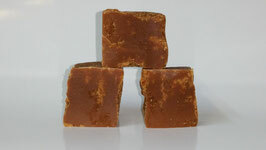 Our Apple & Cinnamon fudge is a handmade soft English fudge with a gorgeous taste of cinnamon and real apples. When you are eating it, it feels as if you are going through a Winter Wonder Land. A true Christmas variety that you should not miss. 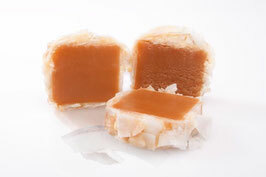 Sugar, Glucose Syrup, Sweetened Condensed Milk, Non Hydrogenated Vegetable Fat, Apple (2%)(Apple, Sulphur Dioxide), Humectant, Sorbitol, Flavouring. 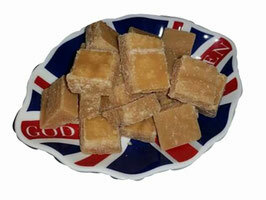 Our Vanilla fudge is an authentic traditional handmade soft English Fudge flavoured with real vanilla. 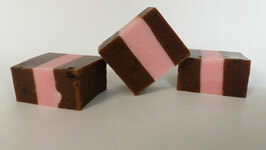 Quality Control Vanilla Fudge Tasting Team As vanilla fudge is our most popular fudge we have no shortage of happy volunteers who which to check the quality by tasting it. However at this time we are unable to offer any full time or part positions in the vanilla quality control tasting section. 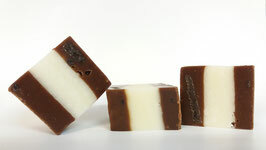 All of our vanilla fudges are handmade and taste tested in England. 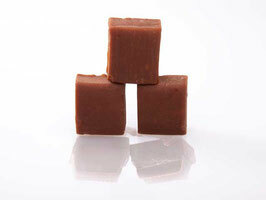 Our Chocolate fudge is a handmade soft English Fudge with chocolate flavouring. Sugar, Glucose syrup, Hydrogenated Vegetable Fat (Palm, Palm kernel), Skimmed Milk Powder, Cocoa Powder, Salt. 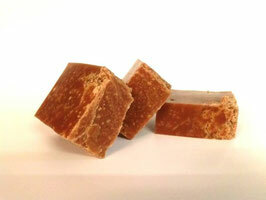 Emulsifier: Soya Lecithin, Flavouring. Our rum and raisin fudge is a handmade soft English Fudge with Rhum flavouring and real raisons. 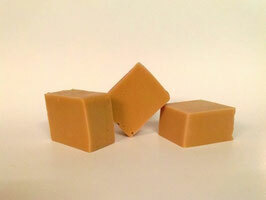 Our Lemon Curd Fudge is a handmade soft English Fudge with real Lemon Curd. In late 19th and early 20th century England, home-made lemon curd was traditionally served with bread or scones at afternoon tee as an alternative to jam, and as a filling for cakes, small pastries and tarts. Homemade lemon curd was usually made in relatively small amounts as it did not keep as well as jam. In more modern times, larger quantities became possible because of the use of refrigeration. Commercially manufactured curds often contain additional preservatives and thickening agents. The basic ingredients are beaten egg yolks, sugar, fruit juice and zest which are gently cooked together until thick and then allowed to cool, forming a soft, smooth, intensely flavored spread. Sugar, Glucose Syrup, Full Cream Condensed Milk, Non Hydrogenated Vegetable Fat (Palm Oil, Palm Kernel Oil), Egg White, Natural Flavouring, Natural Colour: E161b. Our Salted Caramel Fudge is a handmade soft English Fudge with salt. 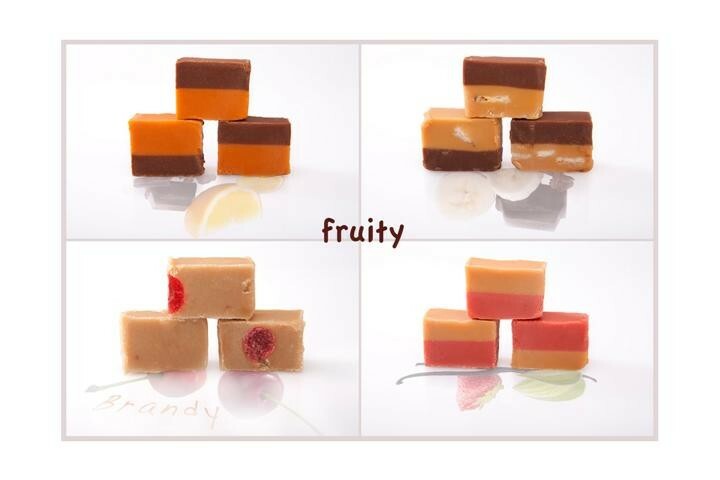 Sugar, Glucose Syrup, Hydrogenated Palm Kernel Oil, Sweetened Condensed Milk, Fondant, Extra Salt, Lecithin E322, Colours and Flavours. Our handmade Scotish Tablet is one of the Classics that comes straight from the heart of Scotland. Sugar, Sweetened Condensed Milk, Water, Evaporated Milk, Glucose Syrup, Butter, Margarine, Fondant, Black Treacle, Preservative; E202, Flavouring. 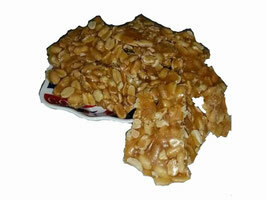 Our Golden Nut Crumble is a sort that is truely inspiring. The Peanuts get cut up and poured over with liquidized sugar. Sugar, Roasted Peanuts (39%), Non Hydrogenated Vegetable Fat (Palm Oil, Palm Kernel Oil), Cream of Tartar, Preservative: Cirtric Acid. 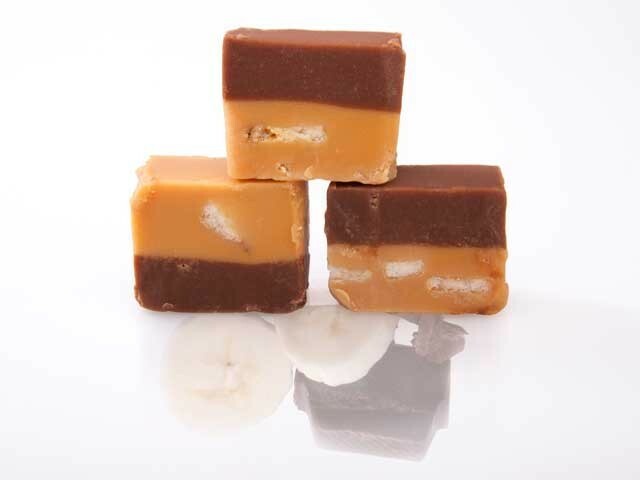 Our Chocolate and banana Fudge is two layers of traditional handmade soft English Fudge one layer is flavoured with chocolate and the other layer is flavoured with banana and has added banana pieces. Single Malt Whisky is malt whisky from a single distillery, that is, whisky distilled from fermented mash made exclusively with malted grain (usually barley), as distinguished from unmalted grain. 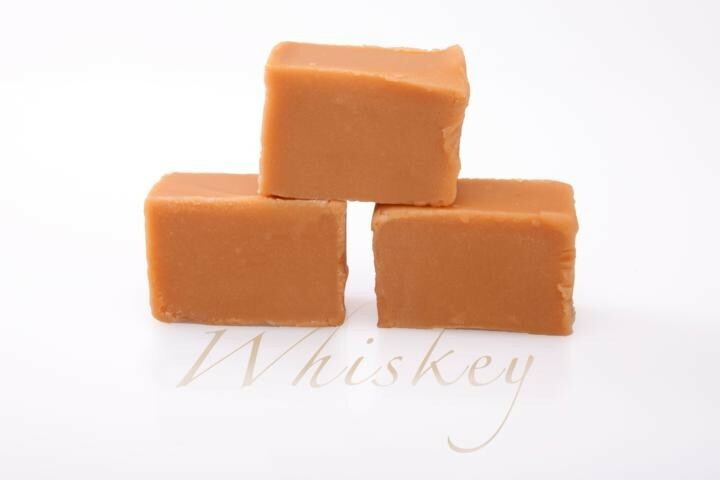 Sugar, Glucose Syrup, Sweetened Condensed Milk, Vegetable Fat (Palm Oil, Palm Kernel Oil), Fondant, Single Malt Whisky, Emulsifier: Soya Lecithin, Flavouring. 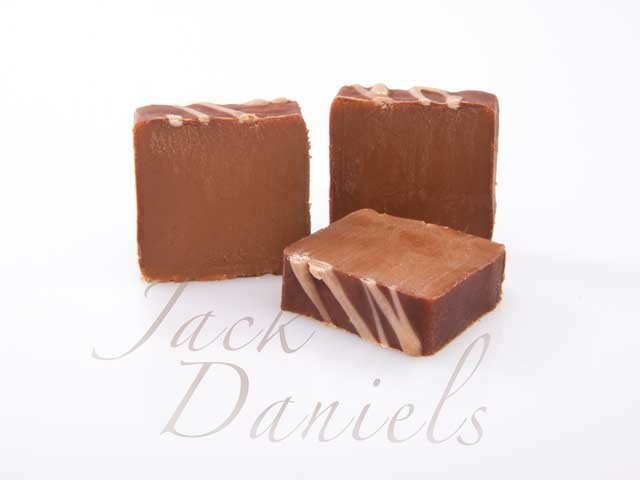 Our Jack Daniels Truffle Fudge is an extra soft English Fudge. It is flavoured with a measure of real Jack Daniels, and covered in rich plain chocolate. Jack Daniel’s is a brand of whiskey made by the Jack Daniel Distillery in Lynchburg, Tennessee, USA. Sugar, Glucose Syrup, Sweetened Condensed Milk, Hydrogenated Palm Kernel Oil, Fondant, Salt, Lecithin E322, Colours: E155, E142; Flavours, Chocolate Coating: Hydrogenated Palm Kernel Oil, Cocoa Powder, Whey Powder, Emulsifier: Soya Lecithin, Flavouring. Our cherry brandy Fudge is a soft English Fudge flavoured with glazed cherries that have been soaked in brandy. Our vanilla and strawberry Fudge is a double layered traditional soft English Fudge one layer is flavoured with strawberry and the other layer is flavoured with our No 1 best selling fudge vanilla. 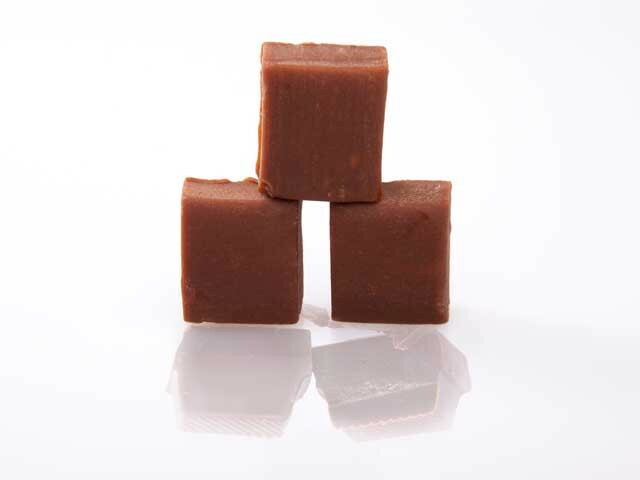 Our Caramel and chocolate fudge is a handmade soft English Fudge flavoured with real caramel and melted flakes of chocolate. Sugar, Glucose, Hydrogenated Palm Kernel Oil, Sweetened Condensed Milk, Fondant, Salt, Lecithin E322, Colouring E150d, and Flavours. May contain traces of Peanut or Peanut Oil. 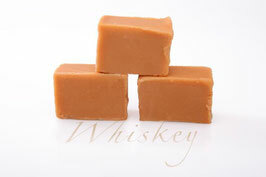 Our Whisky Fudge is a soft English Fudge. 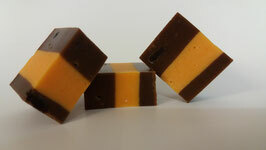 It is flavoured with a measure of real Scottish Whisky. Scottish Whisky is made in the highlands of Scotland. 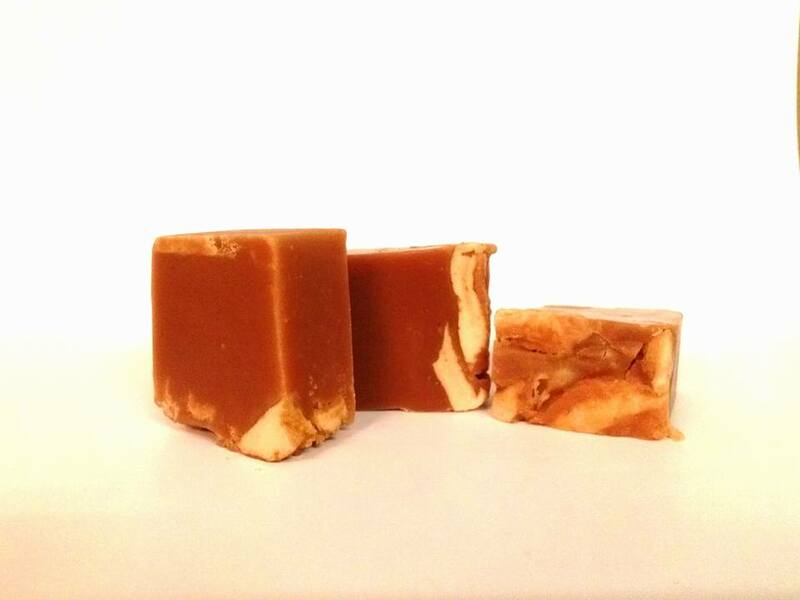 Sugar, Glucose Syrup, Full Cream Condensed Milk, Non Hydrogenated Vegetable Fat, Egg White, Whisky, Flavouring. 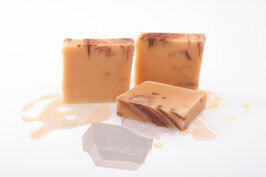 Our rich creamy Sea Salt Fudge is one of our best selling sorts, made with real Sea Salt, you can´t have enough of it. Nice and crumbly and creamy it just falls apart in your mouth, with added cream thats´s in it, it just makes it extra smooth. 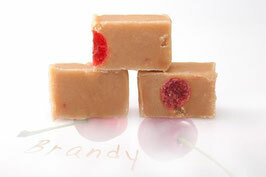 Our No 1 best-selling vanilla Fudge with added fruit and nuts. 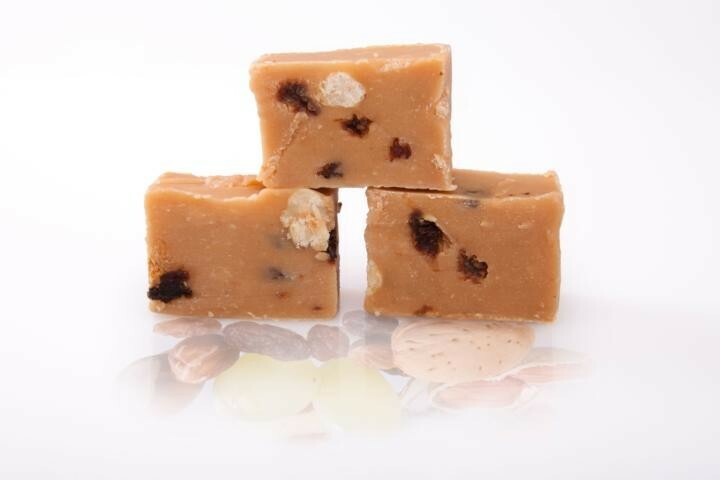 Our fruit and nut Vanilla fudge is a traditional handmade soft English vanilla Fudge with added raisons, sultanas, hazelnuts peanuts and walnuts. Our No 1 best-selling Fudge (Vanilla) with a toffee and coconut covering. 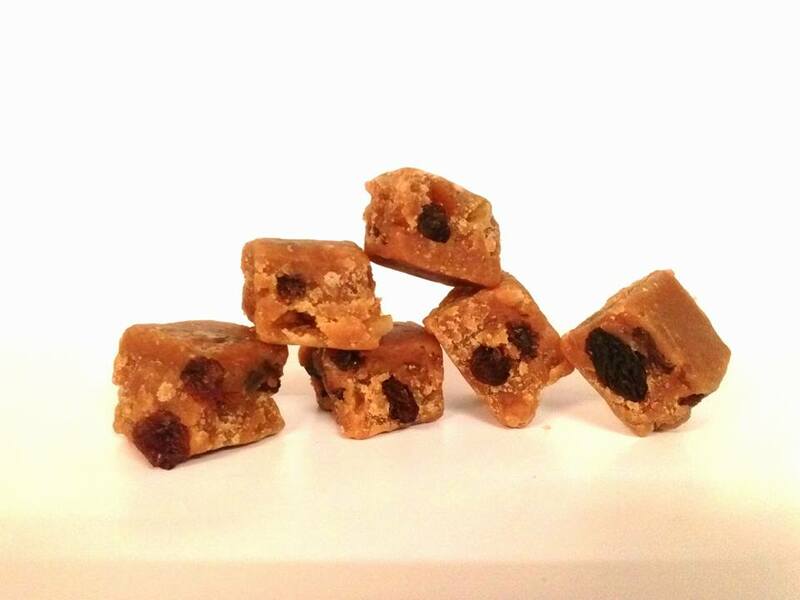 Our Vanilla Fudge Toffee Flake is an authentic traditional handmade soft English Fudge flavoured with real vanilla and then dipped in melted chewy toffee and rolled in Desiccated coconut flakes. Sugar, Glucose Syrup, Chip Coconut, Full Cream Milk, Non Hydrogenated Vegetable Fat, Egg White, Cornflour, Preservative: Citric Acid, Natural Flavouring. Our Oreo Cookie Fudge not only looks like the real deal, with two chocolate layers on the outside and a creamy layer between, it also has chunks of cookie in it. It tastes just like Oreos but it’s still fudge. Oreo is a sandwich cookie consisting of two chocolate wafers with a sweet creme filling in between, and (as of 1974) are marketed as "Chocolate Sandwich Cookies" on the package they are held in. The version currently sold in the United States is made by the Nabisco division of Mondelēz International. Oreo has become the best selling cookie in the United States since its introduction in 1912. Sugar, Glucose Syrup, Non Hydrogenated Vegetable Fat (Palm Kernel Oil, Palm Oil), Cornflour, Sweetened Condensed Milk, Cocoa Mass, Cocoa Biscuit 1% (Wheat Flour, Flavouring Sugar, Rapeseed Oil, Cocoa Powder, Wheat Starch, Salt, Whole Egg, Dextrose, Whey Powder Raising Agent Sodium Bi-carbonate, Ammonium Bicarbonate, Flavouring), Egg White, Gelatine, Natural Flavouring. Our Oreo Cookie Fudge not only looks like the real deal, with two chocolate layers on the outside and a creamy layer of strawberry between, it also has chunks of cookie in it. It tastes just like Oreos but it’s still fudge. Sugar, Glucose Syrup, Non Hydrogenated Vegetable Fat (Palm Kernel Oil, Palm Oil), Cornflour, Sweetened Condensed Milk, Cocoa Mass, Cocoa Biscuit 1% (Wheat Flour, Flavouring Sugar, Rapeseed Oil, Cocoa Powder, Wheat Starch, Salt, Whole Egg, Dextrose, Whey Powder, Raising Agent: Sodium Bicarbonate, Ammonium Bicarbonate, Flavouring), Egg White, Gelatine, Natural Flavouring, Colour (E120). 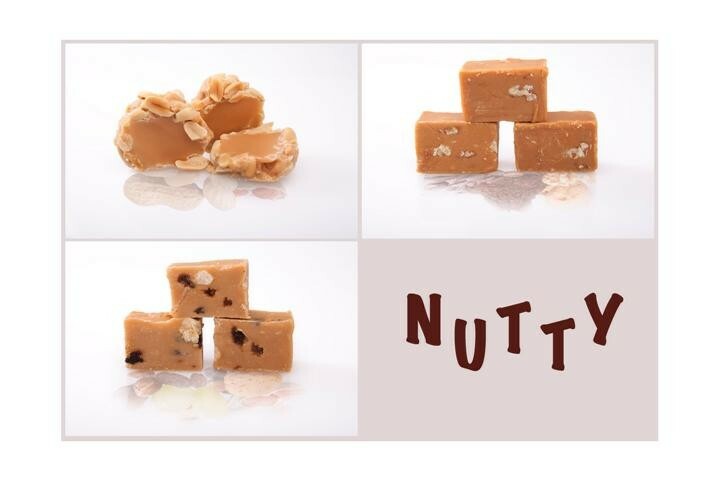 Produced in a factory that handles Tree Nuts/Peanuts, Egg, Milk and Soya. 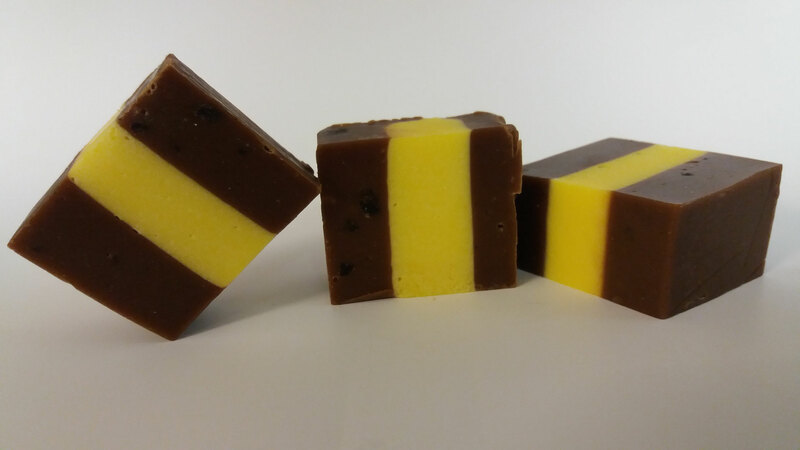 Our Oreo Cookie Fudge not only looks like the real deal, with two chocolate layers on the outside and a creamy layer of Lemon between, it also has chunks of cookie in it. It tastes just like Oreos but it’s still fudge. Sugar, Glucose Syrup, Non Hydrogenated Vegetable Fat (Palm Kernel Oil, Palm Oil), Cornflour, Sweetened Condensed Milk, Cocoa Mass, Cocoa Biscuit 1% (Wheat Flour, Flavouring Sugar, Rapeseed Oil, Cocoa Powder, Wheat Starch, Salt, Whole Egg, Dextrose, Whey Powder, Raising Agent: Sodium Bicarbonate, Ammonium Bicarbonate, Flavouring), Egg White, Gelatine, Natural Flavouring, Natural Colour. Our Oreo Cookie Fudge not only looks like the real deal, with two chocolate layers on the outside and a creamy layer of Orange between, it also has chunks of cookie in it. It tastes just like Oreos but it’s still fudge. Sugar, Glucose Syrup, Non Hydrogenated Vegetable Fat (Palm Kernel Oil, Palm Oil), Cornflour, Sweetened Condensed Milk, Cocoa Mass, Cocoa Biscuit 1% (Wheat Flour, Flavouring Sugar, Rapeseed Oil, Cocoa Powder, Wheat Starch, Salt, Whole Egg, Dextrose, Whey Powder, Raising Agent: Sodium Bicarbonate, Ammonium Bicarbonate, Flavouring), Egg White, Gelatine, Natural Flavouring, Natural Colour: Paprika. Our Oreo Cookie Fudge not only looks like the real deal, with two chocolate layers on the outside and a creamy layer of cherry between, it also has chunks of cookie in it. It tastes just like Oreos but it’s still fudge. Sugar, Glucose Syrup, Non Hydrogenated Vegetable Fat (Palm Kernel Oil, Palm Oil), Cornflour, Sweetened Condensed Milk, Cocoa Mass, Cocoa Biscuit 1% (Wheat Flour, Flavouring Sugar, Rapeseed Oil, Cocoa Powder, Wheat Starch, Salt, Whole Egg, Dextrose, Whey Powder, Raising Agent: Sodium Bicarbonate, Ammonium Bicarbonate, Flavouring), Egg White, Gelatine, Natural Flavouring, Natural Colours: Carmine, Anthocyanin. Our Oreo Cookie Fudge not only looks like the real deal, with two chocolate layers on the outside and a creamy layer with coloured sugar sprinkles between, it also has chunks of cookie in it. It tastes just like Oreos but it’s still fudge. Sugar, Glucose Syrup, Non Hydrogenated Vegetable Fat (Palm Kernel Oil, Palm Oil), Cornflour, Sweetened Condensed Milk, Cocoa Mass, Cocoa Biscuit 1% (Wheat Flour, Flavouring Sugar, Rapeseed Oil, Cocoa Powder, Wheat Starch, Salt, Whole Egg, Dextrose, Whey Powder, Raising Agent: Sodium Bicarbonate, Ammonium Bicarbonate, Flavouring), Egg White, Gelatine, Natural Flavouring, Coloured Sugar Sprinkles.